A110-23 TWY Y WILL BE PERIODICALLY RESTRICTED TO ACFT WITH A WINGSPAN OF LESS THAN 171 FT (MD-11 OR SMALLER) DURING B-787 AND A-340 OPNS ON RY 12L/30R. A110-25 TWY Z WILL BE PERIODICALLY RESTRICTED TO ACFT WITH A WINGSPAN OF LESS THAN 118 FT (B-737-900 OR SMALLER) DURING B-787 AND A-340 OPNS. A110-3 BIRDS FREQUENTLY ON OR IN VICINITY OF AIRPORT. A110-31 TWY V LTD TO ACFT WITH WINGSPAN OF LESS THAN 118 FT (B-737-900 OR SMALLER). A110-34 UNSCHEDULED OPNS BY GROUP 5 ACFT (B747) AND LARGER NOT AUTH EXCEPT WITH PRIOR ARPT APPROVAL CTC AMGR (408) 392-3500. A110-35 NOISE ABATEMENT PROCEDURE: RY 30L/12R IS PREFERRED ARRIVAL RY FOR JET ACFT AND RY 12L/30R IS THE PREFERRED DEP RY FOR JET ACFT. ALL JET ACFT TKOFS ARE TO BE INITIATED FM EOR UNLESS DIRECTED OTHERWISE BY ATCT. A110-38 CURFEW HRS 2300-0700 FAR 36 STAGE II, 2330-0630 FAR 36 STAGE III ACFT LISTED ON THE SCHEDULE OF AUTHORIZED AIRCRAFT ISSUED BY THE DIRECTOR OF AVIATION. DELAYED SCHEDULED FLIGHTS, AND ALTERNATE/EMERGENCY OPERATIONS MAY BE EXEMPT FROM CURFEW HOUR RESTRICTIONS. A110-39 PRIOR AIRPORT NOTIFICATION IS REQUIRED FOR ALL LATE/EARLY ARRIVALS. CONTACT MANAGER ON DUTY AT (408) 392-3500. A110-40 FIRST 400 FT RY 30R & RY 30L CLSD FOR TKOF DC10, MD11, L1011. A110-41 ALL TURBINE ENGINE RUN-UPS REQUIRE PRIOR AIRPORT APPROVAL, CONTACT MGR ON DUTY (408) 392-3500. A110-43 TWY D BETWEEN TWY W AND TWY V LIMITED TO ACFT WITH A WINGSPAN OF LESS THAN 118 FT (B-737-900 OR SMALLER). A110-44 TWY W BETWEEN TWY J AND TWY L CAN SUPPORT GROUP IV ACFT. A110-45 HOT SPOT 3: RY 11-29 IS NOW TWY W1. SURFACE IS USABLE ONLY AS TAXIWAY AND IS MARKED AND SIGNED AS A TWY. 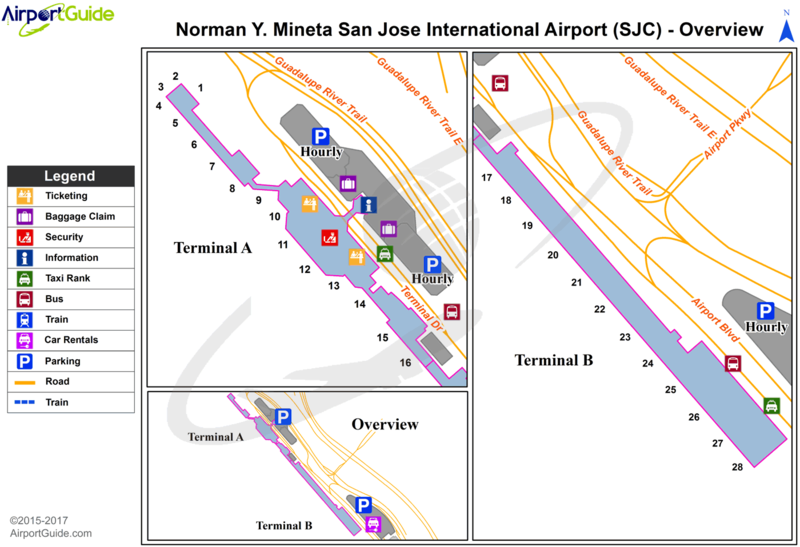 A110-46 HIGH INTENSITY LIGHT ACTIVITY: HIGH INTENSITY LIGHTS (LASERS AND LARGE MEDIA SCREENS) MAY BE VISIBLE TO ARR AND DEP ACFT TO SAN JOSE INTERNATIONAL AIRPORT DURING EVENTS AT THE LEVI STADIUM COMPLEX (37-24-15N/121-58-14W, SJC VORTAC R-303/2.1 DME). FLIGHT CREWS SHOULD USE CAUTION WHEN OPERATING IN THIS AREA DURING STADIUM EVENTS. COCKPIT ILLUMINATION AND GLARE EFFECT REDUCING VIS MAY BE INTENSIFIED DURING ARR AND DEP OPS ESPECIALLY AT NIGHT. A110-47 RRP RQRD FM FBO FOR TSNT HEL OPS. A110-48 FOR CD WHEN ATCT IS CLSD CTC NORCAL APCH AT 916-361-3748. A34-12R/30L 900 FT DSPLCD HR ON NE END NOT GROOVED. A43-30L RWY 30L PAPI UNUSBL BYD 7 DEGS OF CNTRLN OF RWY. A57-12R APCH RATIO 50:1 TO DSPLCD THR. A57-30L APCH RATIO 50:1 TO DSPLCD THR. 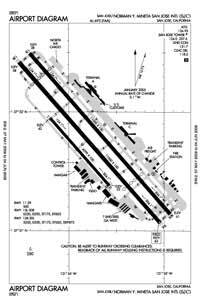 A81-APT ACTVT MALSR RWY 12R, MALSR RWY 30L, HIRL RWY 12L/30R, HIRL RWY 12R/30L - FREQ 124.0 WHEN TWR CLSD. E147 TPA 942 FT AGL SINGLE-ENGINE ACFT, 1442 FT AGL MULTI-ENGINE & TURBINE POWERED ACFT. Single Wheel Landing Gear: 220. Dual Wheel Landing Gear: 250. Dual Dual Tandem Wheel Landing Gear: 875.